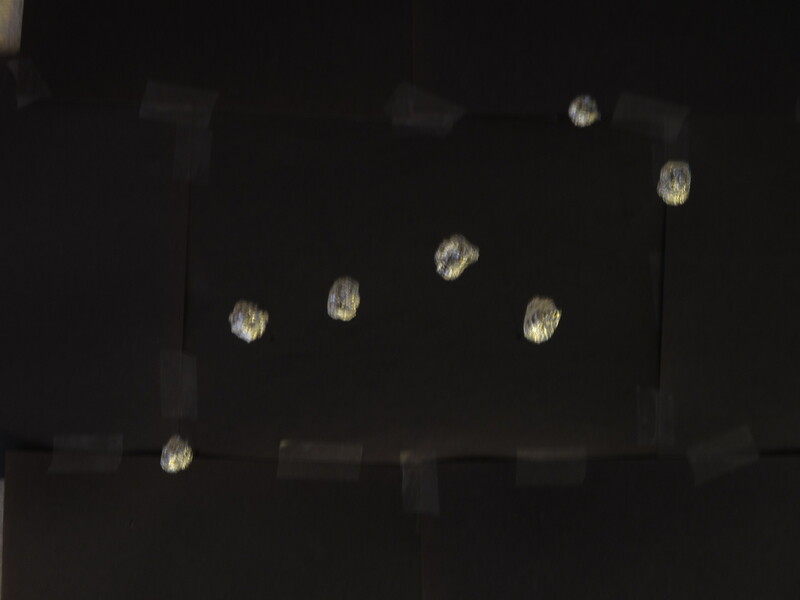 Build a model of a star constellation, with the stars spaced apart to scale. The constellation looks completely different from a different angle (aka different places in the galaxy). Cut lengths of black thread, one for each star in the constellation. Make them all the same length, a few cm longer than the longest length needed. Tape a flat piece of foil to a thread end, then scrunch into a round ball (representing the stars). Make enough of these for the number of stars. Cover the cardboard circle with black paper. Lay the constellation template over the centre of the black paper circle, and tape with removable tape (e.g painter's tape, or use masking tape lightly). Poke holes through the cardboard corresponding with the pattern of stars with the stick, then remove the constellation template. Choose which star to hang first, then check it’s position on the cardboard by looking at the constellation template, and check its thread length on the table of thread lengths. Push the free end of the thread (the other end from the star) through the correct hole in the cardboard, using the skewer to push it through. Pull the thread through the hole until the star is hanging the correct length below the black side of the cardboard, then tape the excess thread on the backside (non-black) of the cardboard to secure it. Lastly, lightly tape the hanging thread and star to the black cardboard so that it does not get tangled with other stars as they are hung, but so that the tape can be removed once all the stars are hung. Repeat threading, measuring and hanging for each of the stars. 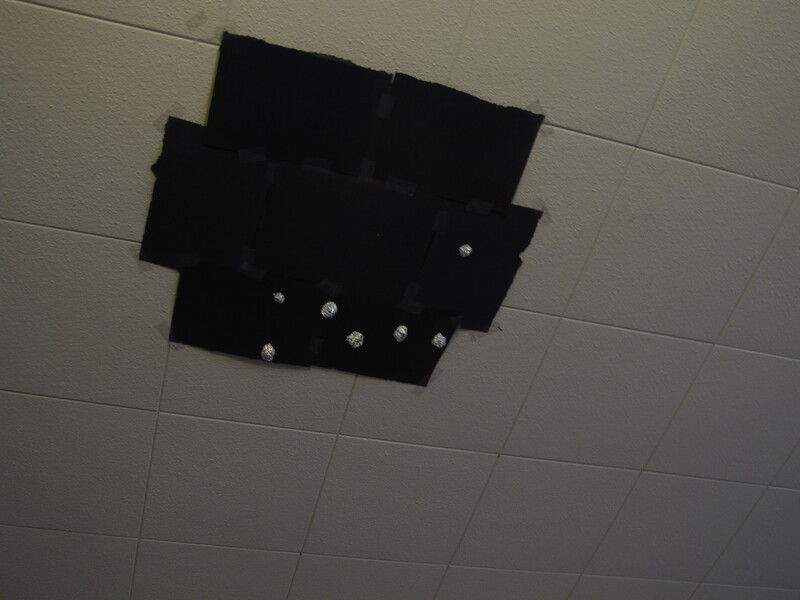 Once all the stars are threaded through the cardboard, remove the temporary tape to release them into hanging position, then hang the model from the ceiling or a wire with string, making the string as inconspicuous as possible from below. If the cardboard is not stiff enough to stay flat on its own, use a smaller square of double thickness cardboard, make a hole in each corner of this, loop string through so it can hang level. Tape or staple the round cardboard, with stars hanging below it, to the bottom of this stiffer cardboard. Stand, sit, or lie directly under the constellation so that it looks as we see it from earth. The black thread should be invisible against the black cardboard, and the shiny stars should appear to float. Move to the side, and notice how the stars that appeared to be in one plane from below are infact at very different distances from "earth". Watch how the constellation rapidly changes shape as you move around the room - this is equivalent to you moving to different places in the galaxy. Find new patterns in the stars as you move, and give them names. The students were not as interested in this activity as expected. Maybe the concept of distances between stars is better for older ages?